The Indians pronounced the name of Egan, Ehegante; but the soldiers and the white men living near the Indians' reservation, situated in eastern Oregon, called him Egan. Egan was born a Umatilla. His father and mother were both from the Cayuse tribe who lived in the valley of the beautiful Umatilla River. That river flows from the springs and creeks of the lofty Blue Hills of Oregon, and with a length of about forty miles coursing westward, enters the Columbia River, not far south of the old Fort Walla Walla; where is now the little village of Wallula. When very small, Egan's father and mother, with several other Cayuses, were away from home out on a meadow gathering wild onions and other kinds of nature's food. They had in their camp of tepees men, women, and children. Suddenly a wild war party of Indians from the Snake country came upon them and a fierce battle occurred. All the Cayuses in the camp were killed except the children. These children were carried off and scattered among the Snakes and the Piutes. Little Egan was left with and brought up by a good Piute family. When he was old enough, he became famous among the young Indian hunters. He was above the medium height, very handsome, strong, and athletic; could lead any party in fishing the streams, climbing the mountains or chasing the deer. He could not have been more than twenty when he married the sister of Shenkah, a Piute chief. This chief called him brother. Side by side with Shenkah he had fought against hostile tribes of Indians and against the white settlers and soldiers under our General Crook, till he himself became a well-known war-chief. While Winnemucca the second was the acknowledged chief of all the tribes of the Piute nation, Egan held the headship of a tribe in 1872, which, about that time, left Nevada and journeyed several hundred miles to Malheur, eastern Oregon. Before this, Egan's tribe was not a very settled people, under no real control; composed in great part of wild, roving, half-starved bands, off in the mountain districts, far from white farmers, and depending for their living on hunting, fishing, and, too often, on stealing the sheep and cattle of the settlers. In the winter of 1872 and 1873, when the snows were deep, there were then at Malheur about a thousand Indians, Piutes mainly; but some were Bannocks and some of the Snake-River tribe. In 1874 they had an excellent agent, Major Sam Parish. He and Chief Egan soon became the best of friends. In the spring, Parish set apart twenty acres of good ground, and tried to teach the Indians, hardly wiser than untaught children, how to cultivate the land and raise crops. Through Egan the Indians came to love Major Parish, while in a school for the little ones Mrs. Parish more than seconded her husband's efforts. At the start they were awkward and slow to learn practical farming, but soon they made progress, for they had promised Egan that they would do their best. Over and over again the agent showed them just the right way to plow and harrow, furrow and plant, till perseverance won the day. Before very long they saw the result of their labor in fields full of corn, potatoes, squashes, onions, and turnips, and all this product was to be their own. But the best part of the trial was: "The Piute would work!" In 1876, more than one hundred acres were covered with fine crops, and the Indians had done the good work themselves, and were reaping the reward. The Indians at this time, as a rule, were contented and happy, with the exception of a few unruly ones led by a "dreamer" named Oytes. He called himself a "medicine-man," and his influence was much like that of all the other medicine-men among the Indians. They always had some queer ways of thinking and acting. Quick-witted, ugly in appearance, and strange in their conduct, they would frighten men and women by their claims of supernatural powers. Oytes said: "I can defeat all our enemies! No bullet can hurt me. I have the power to kill any of you! It is wrong to dig up the face of the earth,�the earth is our mother; we must live upon what grows of itself," etc., etc. 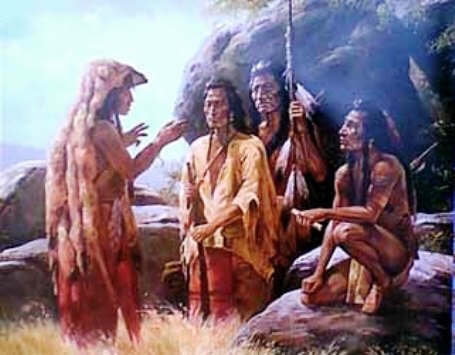 After a few days Major Parish was told by the good-hearted Egan about Oytes�how wicked he was; how discontented he made many of the Indians; and how idle and worthless many became from his example and his teaching; furthermore, he planned to assassinate the agent and Egan. At last Parish sent for Oytes and said to him in the presence of his friends: "I have three hundred dollars in a bank. If you will stand up before me and let me fire a bullet from this gun straight at your breast, and if it passes through your body and does not hurt you,�as you say it will not,�I will give you the three hundred dollars." Major Parish had his good rifle, well loaded, in his hand. Poor Oytes could not hide his terror. He cringed and squirmed to get away; but Egan made him stay there before the Major, and as soon as Oytes could speak, he said to the interpreter: "I am wicked, wicked; beg the good agent not to kill me! I will work and I will never give him and Egan any more trouble." And as long as Major Sam Parish was Uncle Sam's agent at Malheur, Oytes kept his word. In the fall of 1874, I came to command the department within which was Malheur. With Captain Sladen, my aide, and my daughter Grace (a young lady of seventeen), I rode in a spring-wagon drawn by mules the forty miles from old "Camp Harney," via Malheur City, to the Malheur Indian agency. It was then a rough sage-brush country, with very few houses and settlements. I remember how terrified my daughter was at the tavern in Malheur City on account of the noise and disturbance of drunken white men. At the agency, Mr. Parish and his good wife, aided by Sarah, the interpreter, made us very welcome and comfortable. In the night the Indians had a noisy dance lasting many hours. I heard the sounds, and they seemed to me as wild and' frightful as the Apache war-dances which I had witnessed some years before. Uneasy in mind and sleepless, I rose about midnight and dressed, visited the agent and inquired what was the matter. Parish laughed and sent for Chief Egan and Sarah. "Oh," said the chief, "we were all so happy that General Howard had come and had brought the young lady, his daughter, that we had to celebrate the event by a good feast and dance." I was satisfied and happy to let the feast and the dance go on, so returned to my comfortable bed and was able to sleep without any further interruption till morning. My intimate friends always teased me about that experience and asked: "What were you afraid of at Malheur?" I answered, "My alarm was simply from superstition based on ignorance!" Early the next morning I visited the agent's office and had an interview with Chief Egan, Oytes, and several leading Indians. I noticed then how superior Egan was to the others. He had on an ordinary farmer's suit of light linen duck with a leather belt around his waist, a sheath holding a sheath-knife by his side. He wore a straw hat that he removed when he spoke to me. He had all the features of a full-blooded Indian, but wore no braid or ornament. His hair, parted in the middle, was cut short at the neck. His pleasant face and resonant voice were mainly used, that morning, in praising Major Sam Parish, and in telling me how grateful all the Indians were that the Great Father had sent them such an honest agent and good friend. The Indians had been roaming and wild and had never had a school before for the numerous children. Now they had a beautiful school and a mother teacher whom all the little ones loved; Mrs. Parish, the teacher, and Sarah, the interpreter, made all this very plain to me. In 1877 I had a long-drawn-out trouble with Chief Joseph and his Nez Perc�s, from May till November. Buffalo-Horn, a war-chief, brought me from Idaho about a dozen of his Bannocks to help my soldiers as scouts. The Piutes under Chief Egan also refused to help my enemies, so remained at Malheur and improved their land and raised good crops upon many acres of it. Sometimes during my long march in pursuit of Joseph�a march of over 1400, miles�Buffalo-Horn became dissatisfied with my officers and myself because we would not let him kill two friendly Nez Perc�s, and because I did not conduct the war to suit him. On this account and for other causes, the next year, as soon as the bunch-grass became green and abundant, Buffalo-Horn and a body of Bannocks began a dreadful raid, coming west from the farthest eastern edge of my Department. As they came they stole horses and cattle and destroyed the houses and families of the white settlers in the usual wild Indian way. They forced to join them band after band of "Snakes," Columbia Indians, and Piutes; also took in scattered families of the Cayuses and Umatillas. At the Great Stein Mountain in southeast Oregon, some 400 miles from the place of starting, Buffalo-Horn's Indians under a new chief, for Buffalo-Horn had fallen in one of his battles with my soldiers, met and made an agreement with the Malheur Indians of Egan. Before this, on the first of May, 1876, everything had been prosperous at Malheur, the children all at school and the fields already planted, and the ditches to bring water to the gardens well laid out and dug, and store-houses and stables constructed. The Indians, old and young, with scarcely an exception, were well and contented. But toward the last of the month, Major Parish called the people to the school-house and then amid a great silence he said: "I have received a letter from our Big Father in Washington saying another man is to come here in my place. You must do just as he wants you to do. Go right along just as you have done while I have been with you." It was Rinehart who was coming. He had lived in Canyon City and many of the Indians knew him. They all were against the change of agents. Egan went to Colonel Green at Camp Harney and begged him to try to convince the Big Father to let Parish stay. I was written to and besought to stop the change, if I possibly could. Egan and Oytes declared that Rinehart had sold many bottles of fire-water to the Indians. After the new agent came there was another talk. Egan's speech at this time is on record. It is: "Our Father (meaning Rinehart), we cannot read; we don't understand anything; we don't want the Big Father in Washington to fool with us. He sends one man to say one thing, and another to say something else. Major Parish told us the land was ours, and what we raised on it would be ours. You say it is government land and not ours." Egan called Rinehart's attention to the work they had done, and to the cruelty of taking the land and the crops from them, etc., etc. Rinehart at once became angry and said: "Egan, I don't care whether any of you stay or not. You can all go if you do not like the way I do!" Next, all went to work, as the agent had promised to pay in money every one who worked faithfully. At the end of the week they came to Rinehart's office for their pay. He at once estimated the value of, blankets, coats, trousers, shoes, socks, woolen-shirts, handkerchiefs, looking-glasses, shawls, calico, muslin, sugar, tea, coffee, etc., etc. He was going to pay them in the things that Uncle Sam had already given them. Egan then spoke again: "Why do you play with us? We are men and not children; but never say you are going to pay us in money, and then not do it! I do not care for myself, but my men want their pay. Pay them in money, and then they can go and buy whatever they like: our Big Father's goods are too dear. We can go to our soldier fathers and get better blankets than yours for half the price you charge." Rinehart became more angry than before and said, "If you don't like my ways you can all leave here. I never allow a white man to talk as you have." The Indians went to their tepees to mourn and talk all night. Next day, to make matters worse, a band of Piutes came who were nearly starving. Rinehart curtly refused to give them a mouthful. The morning after, Rinehart saw a little boy who did not understand English innocently laughing; he seized him by the ear and kicked him till he cried aloud from pain; and he told the Indians that he must be instantly obeyed or he would treat them as he did the boy, who had not carried a message as he told him. Oh, the misunderstandings and heart-burnings of these poor people! Chief Egan and his best men appealed from the decisions of the Indian agent, but to no good result, for just then Uncle Sam was trying to make his red children work for all they had, and such an agent as Rinehart made their tasks as painful and difficult as possible. Hatred begot hatred, and all the Indians at Malheur in despair went off to live by hunting and fishing and gathering of herbs and fruits, as their people had always done. Months after the Indians left Malheur and Rinehart, it was on Stein's Mountain that the Bannocks in their war-raid came upon hundreds of them. "Come, go with us," they said, "and we will beat the white soldiers, and conquer all the white settlers who have our lands, and be rich and no longer poor." Chief Egan held out against war as long as he could get a hearing. The Indians put him aside and put Oytes at the head of the discontented of the Piutes for a time, but after long reflection and the saving the lives of several of his friends, whites and red men, Egan at last consented to be their war-chief. He commanded in several battles, but was never very successful. After the last battle of the Piute and Bannock War had been fought, Egan's life was taken by Umapine, a Umatilla scout. Umapine was a cruel and wicked man, and did not live long after that action of his in the Blue Hills of Oregon. Our surgeon, Doctor Fitzgerald, obtained from Umapine the head of Chief Egan and sent it as a fine specimen of an Indian head of large brain to the Medical Museum in Washington. The Piutes felt keenly this last and greatest humiliation that their much loved chieftain's head should have such a dreadful and ignoble resting-place. Egan lost his wife and two children in war, but a little one had remained till his death to comfort him. All the white people and all the Indians spoke well of Chief Egan. He had often borrowed money and food of our officers, but always repaid what he borrowed. He was exceedingly kind to his niece and to his youngest child. This story of Chief Egan is featured in the book entitled Famous Indian Chiefs I have Known, by General Oliver Otis Howard, New York, NY, The Century Co. 1916 that was first published in 1908.